I am so thrilled to to be part of Altenew Watercolor Brush Markers Release Blog Hop + Giveaway as Guest designer! I really can’t believe myself I consider my self so lucky to share my cards along with such amazing talented designers. You have just arrived from Anna Komenda’s blog . I love her creations and layout . So creative and amazing . I made many cards for this blog hop especially it featuring the third release of the Altenew watercolor brush marker it’s Altenew Tropical Fiesta Watercolour Brush Markers. This one had a very unique colors that you can use by themselves or by combining them the other Altenew brush markers to create many cards shadows.. They have these amazing colors . For the cards I made it was hard to arrange them in this post so I thought to arrange them with the oldest to the newest that I made in order . In these cards I used Altenew Tropical Fiesta Watercolour Brush Markers over the amazing Altenew monochrome washi tape . ‘ın the first one , First I Iadhered the washi tape over a heavy card stock, then I applied generous amounts of clear gesso over the whole washi tape and I leave it to dry . I wet the area around the pretty watercolored flowers images with brush with clear water . After that I applied the colors from fromAltenew Tropical Fiesta Watercolour Brush Markers and Altenew Winter Wonderland Watercolor Brush Markers they blend just amazing with each other . I added some purple wine in the center of the flower. I die cut the card center with oval die cut yo focus more on the are that have flower on it .placed it over a foam sheet .I used lava rock to darken the edges of the oval . It was just perfect for shadowing with great blending ability. I stamped the sentiment over a vellum . While I making the first card , I had the idea to color only the die cut part so I die cut these 3 circles and applied gesso over them and placed them over a matched die cut foam to give it more dimensions. I had this idea to add a little of the clear gesso around the circles. And colored it . And It came just perfect . Thus is my most favorite card in these cards that I made for this hop . I hope you like it too . For my 2nd card , i was able to watercolor over a vellum . And it was a thing i tried it many time . First i applied clear gesso over the heavy vellum which was a tricky thing to made . to let the gesso dry without wrinkles on the vellum was not that easy. I run it between two glossy surfaces in the die cutting machine to straight them . Then I stamped the image with altenew black permanent ink , the images fromAltenew beautiful peony stamp , and I colored it with these colors crimson, fresh lemon, turquoise, lime , and lava rock from Altenew Tropical Fiesta Watercolour Brush Markers. . I stamped the sentiment with black ink from Altenew inked rose stamp set . Add white splatter. Trim the edges . The add this silver thread at the top to brighten the card. It was a new tricky experiment I wanted to share it with you . But I am not going to make it that much . Next one , I used Altenew beautiful peony stamp and to creat this cas card .. I stamped the images from Altenew beautiful peony stamp with black ink like the previous card . I used these colors crimson , lime , and lava rock from Altenew Tropical Fiesta Watercolour Brush Markers. to color the images. And diluted pigments for the surounding from the same colors as I colored the image . and I added splatters from these same colors in the background. I stamped the sentiment from Altenew handpicked boutique stamp set. So excited to share these two funky cards I made , in these two I spend some relaxing time making these backgrounds card . In this card I applied these wide strips over a watercolor paper. With diffrent colors here in this one I used turquoise, desert night , lagoon , and purple wine from fromAltenew Tropical Fiesta Watercolour Brush Markers and Altenew Winter Wonderland Watercolor Brush Markers . Then stamped these sentiment and small circlur doodles from altenew watercolor dots stamp . With black ink , as extra color I added this gold shimmers to brighten the card . For the second card I used the same blue colors as above for the wide stripes, I added the circlur on purples wine , then the gold shimmer in the other direction . Love the colors the shapes on these two cards . I used the same on this card too . For this simple photo frame I used a bright colors from Altenew Tropical Fiesta Watercolour Brush Markers to color this big floral image from Altenew sketchy floral stamp . I stamped the image with a gray permanent ink over watercolor paper . I applied these colors crimson, fresh lemon, purple wine in the flowers . The sweet leaf lime , and lava rock for the leaves . Then I sprayed it with water to give it this loose watercoloring effect . I applied the turquoise for the outer side. I added some white splatter and I framed it . First I draw these circles over the pattern paper, I choose this one I liked the stripes on it from Altenew Live your dream 12×12 paper set. . I applied clear gesso over it . After it dried I applied water inside the circlur with clear brush then i added the colors here the idea was to color each one of these circles with different colors but still compatible with the background. I used desert night , tourquise, lagoon and lava rock from Altenew Tropical Fiesta Watercolour Brush Markers and Altenew Winter Wonderland Watercolor Brush Markers . I applied these small squares in diffrent area using grid stencile with white embossing past .After that I stamped the leaves inside the circles from Altnew happy dream stamp after I definit it with black marker . I added some white splatters and white hear drooling . I placed it over black card stock and I added these sentiment on black ..after that , I cut these butterflies from refection 6×6 paper pad from Altenew new day card kitand i added there on the card at the end. I couldn’t resist making a tag as I love them so much here is my tag idea.. I die cut this oval tag .. then i applied this thread on it in this way and i addhered with super glue. Then i add good amount of white gesso . After it dried i added there colors .. lagoon, turquoise , desert night, purple wine , jet black, and Persian blue fromAltenew Tropical Fiesta Watercolour Brush Markers and Altenew Winter Wonderland Watercolor Brush Markers .. Then I stamped and embossed these images from Altenew motifs stamp set with black embossing powder . After that I die cut this u from altenew fine alphabet dies and amazing I stamped from Altenew label love stamp I added some ribbons at the end ..
Altenew is giving away a $40 gift certificate to six lucky winners! 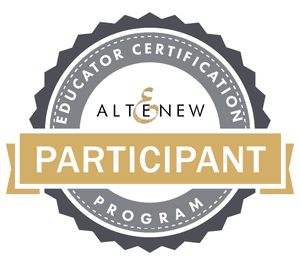 Please leave a comment on the Altenew Card Blog and/or Altenew Scrapbook Blog by Thursday, March 28th for a chance to win. Your next stop is Laura volps’s blog . I like her cheerful creations. ! Below is the complete blog hop list. Many Thanks every one for stopping by I hope you get encouraged to try any of these techniques. I hope you enjoy your days ..
Wow, a great bunch of techniques and cards. Thanks so much for sharing your creativity. You have been very busy making watercolor cards! So many nice techniques. I kept going back to the very simple peony one with minimal color, so I think that must be my favorite. Thanks for all your hard work! What beautiful cards! I loved every single one. And to have all of the videos was so great!!! Thank you so much for sharing your talent on this fun blog hop. I just love these beautiful new watercolor markers. Just gorgeous colors. Off to finish this wonderful and fun hop. I LOVE all of your cards!! They are all stunning! I enjoyed watching your process on your videos. Thank you for sharing! Absolutely love your color choices on all your cards. And I can’t wait to watch your videos. Wonderful job. Thanks for sharing your creativity! Okay, no, THESE cards are my favorite! You have gone above & beyond making so many lovely cards for us to feast our eyes upon! I can’t imagine how long it must have taken to make a video with each one. I’ve enjoyed watching them. I love the depth of colour you can achieve with these Altenew Watercolour Brush Markers. So very well done! Wonderful cards and ideas! Your use of gesso as a watercolor base really opens up a lot of design possibilities. Your cards are incredible! Stunning! Your cards and techniques are amazing. I love how you used washi tape and watercolored the background. Many of your cards are truly stunning. Your use of soft colors for your florals and backgrounds are gorgeouos. Thanks for sharing your time and talent with us. What beautiful cards. I love the idea of painting over washi tape! So clever! Love the look of the coloring on vellum. Such beautiful colors and creations! Gorgeous cards! I love your designs! Wow, Maryam, so many stunning creations! Way too hard to pick a favorite! Love that you have videos to show the process. Thank you! Beautiful cards. I love the unique styles and the colors are gorgeous. Incredible cards -love the softness of them all, especially the first couple – they have an incredible dreamy quality to them. Beautiful! Wow! Thank you for all of the wonderful videos! Your cards are really beautiful! I really like your first few cards with the washi tape- what a beautiful technique! Your mixed media cards with the washi tapes and watercolors rival work in an art museum. And love what you did with the peony stamp. Your cards are stunningly gorgeous! Impressive, eye-catching and very unique cards. I’ve bookmarked your post so that I can rewatch the video at my leisure. I like how you used the gesso and plan to try the same technique. Thank you for sharing and inspiring! You are an amazing artist! As I have just started with watercolors, my cards are so very simple. You’re work inspires me to keep trying :-). Simply stunning and such wonderful colors! Love how you did this! These are stunning! I love the look of the watercoloring over the washi. Such beautiful cards! I love all of the different designs and techniques you used! Your cards and techniques are absolutely amazing!!!! You are so talented and creative! Very unique and beautiful cards. Thanks for the videos also. Amazing projects Maryam! So many different techniques which really showcase these bright new pens wonderfully! So pretty and add so much to your clever design! Thanks so much for sharing and the great inspiration! All the projects are just amazing, Maryam! And thanks for including so many videos. They are very helpful. My favourites are the last two projects. They are so artsy and beautiful! What a beautiful collection of cards! I love Altenew’s washi tapes, but seeing you use gesso and then add watercolor to them – it’s just brilliant! Lovely mixed media cards – I look forward to trying some of your ideas myself! Thank you for participating in the blog hop today. Gorgeous work! Wow wow wo! You have outdone yourself!!! I’m loving the dreamy looks you’ve created and I’m head over heels in love with the one using washi tape! Wow, I love all the projects you made with these markers, especially how you concentrated on creating softer colors. Though I have to say, my favorite is the one with the washi tape. I wouldn’t have thought of combining those at all, but I love the new colors you were able to create with light glazes of watercolor. Thanks for sharing all these wonderful ideas with us! Amazingly creative and fabulous projects! What a wonderful collection of cards. I LOVE the technique of applying gesso and watercoloring over the washi tape – stunning effect and so clever. Wow! What a wonderful variety of cards! I love all the different ways you used the markers. Beautiful cards! What wonderful cards. Very inspiring. The brush marker technique is something I haven’t tried to keen to do so now. wow your cards are all stunning your very very talented. Your technique is very different i have never seen washi tape that large. Would love to try it tho. I am fascinated by water coloring. Winnie and walter color challenge..